Of all the locations you can map and create, libraries are my favorite. Whether it is a little room tucked in the corner of a villa or a complex to rival the Library of Alexandria, I quite enjoy fleshing out library contents and filling them with a bit of magic. This is the first entry in a series on the subject and today the focus will be on books. Whether you are dealing with a primitive archive or a vast temple library, your will need to have contents. 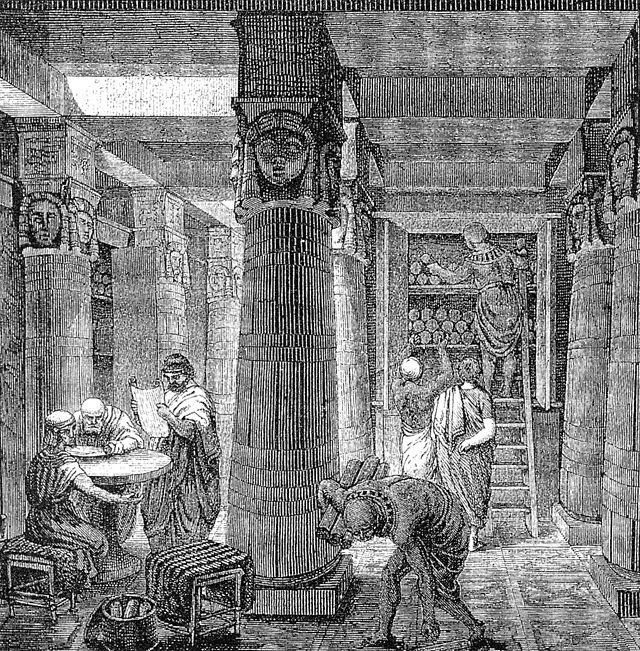 Alexandria had hundreds of thousands of papyrus rolls, the Imperial Library of Constantinople had perhaps 100,000 books, the Fatimid caliph al-Aziz created a forty chamber library in the imperial palace that contained between 200,000 to 600,000 volumes. 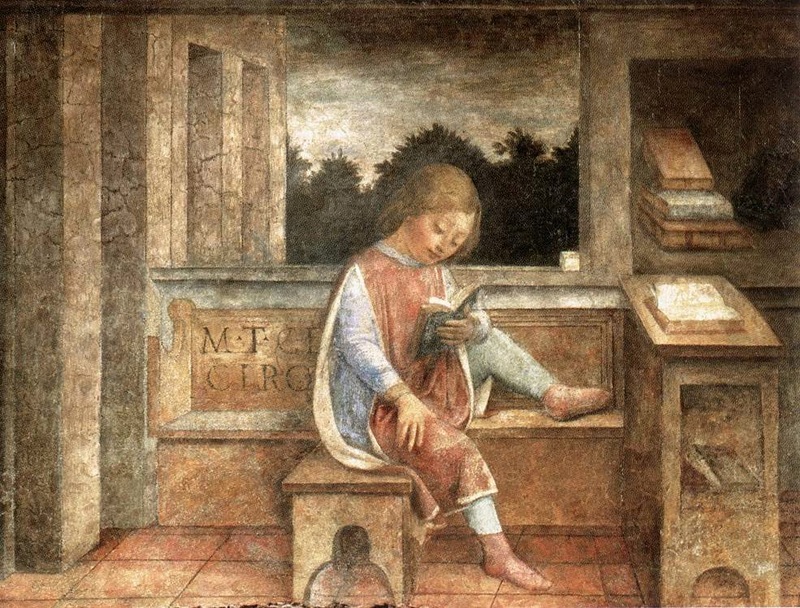 Even libraries on a less grand scale like early small monastic libraries after the fall of Rome had over 300 codices at times. Obviously you don't need to list every title or describe each entry in detail but there are ways to help give your players a sense of the library's contents and inject interesting hooks for future adventures as well. This article will address some of the basic elements and provide examples of how to randomly generate libraries using the Gamandrian setting (these can easily be converted to any setting you want though). Before you start thinking about titles, you will want to consider what kind of writing surfaces people use in your setting. 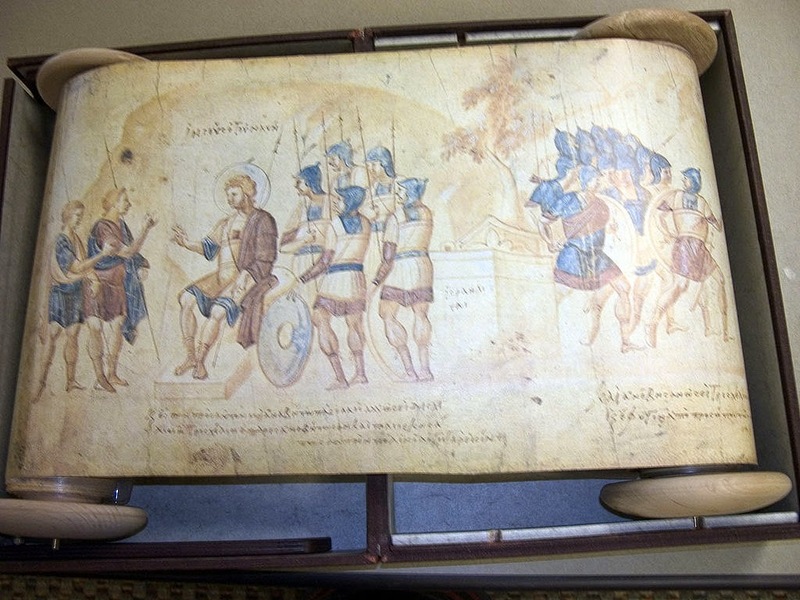 Codices, which are the similar in shape to the books we use today, were not developed in the west until at least the first century when Martial first mentions them, however it took time for them to replace the papyrus rolls common in the ancient world. By 900 AD most books were codices, with rolls being used mainly for documents. But even before people were writing on papyrus scrolls, they used other surfaces like wood or clay. Simply create a table that reflects the likely book forms found in the library you are creating. Be sure to set the probabilities to reflect the chances of a particular type of book being present. This chart and the ones that follow can be used prior to play to generate a list of example titles or during play as players peruse the cases. Gamandria is Ancient with occasional ventures into late antiquity so the tables below reflect that. Note for convenience the term Roll refers to a book roll read horizontally while the term Scroll is used to refer to a book roll read vertically. Most classical papyrus book rolls had text that read horizontally along the page. Tablet: These can include tablets of clay, stone and pieces of bone or wood. Anything that has text etched into its surface or painted upon it. Typically the text will be engraved or etched with a stylus or chisel. This is one of the oldest surfaces for writing. These can vary considerably in size, shape and purpose. The above chart assumes items such as this are relics from the Nong Sai era. 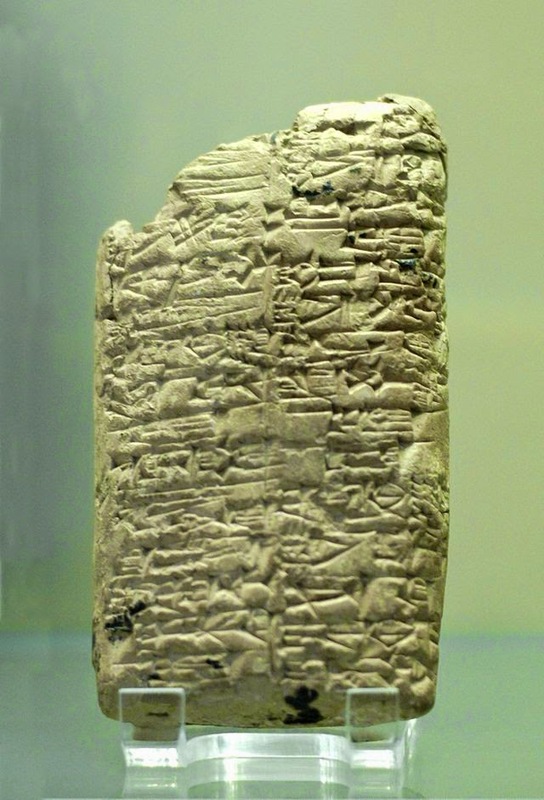 The most notable tablets are those of ancient Mesopotamia, though the Greeks also used similar mediums for writing (like pieces of pottery called ostraka). Mesopotamian Clay Tablets included hymns, laws, myths, lists of words, and even rules of math and writing. They frequently feature a colophon or additional inscription that provides an overview of authorship and content. One chief advantage they have is their durability. They don't burn like Papyrus or parchment. Their disadvantage is capacity and convenience. Roll: These are rolls typically made up of vertical papyrus strips that are placed side by side and overlaid with horizontal strips. They are pressed together with adhesive to form a single sheet, which is usually 30 to 40 centimeters in length and 11 to 24 centimeters wide. Sheets are then adhered tougher to form longer rolls (usually made up of about 20 sheets). These require two hands to read, and text is written horizontally divided into individual pages (rather than continuously). Rolls can also be made of parchment. Leather buckets are used to carry around multiple rolls. Scroll: Similar to rolls except the text is written vertically and often continuous. Codex: This is a later book technology in the West that developed from the wax tablets used in Rome. They are rare in the Gamandrian setting, though not unheard of. The exact design can vary but usually is formed with quires of four folded sheets of parchment or papyrus (most often parchment). A quire is just a gathering of sheets put together. These are then bound, often between a heavy cover. The codex has the advantage of capacity and portability. It is generally more durable than a roll as well, because it usually has a cover and uses parchment rather papyrus. Books can generally be divided into two broad groups: poetry ad prose but we will deal with more specific divisions within those categories rather than treat them so broadly. The following are possible subjects volumes in your library could cover. Use Table Two to randomly determine the subject. Keep in mind if you have rolled on Table One, your result will influence possible subject matter depending on your setting's history. For example in Gamandria a clay tablet, because it would likely be from ancient Nong Sai probably wouldn't be an ethnography. If the result of your Book Type and Subject do not match simply re-roll. Annals, Documents or Records: These include any documents, log books, correspondence, accounts, records or ledgers kept to archive events. These could be compilations in a volume or individual sheets. Examples include the Annales Maximi and The Letters of Marcus Cornelius Fronto. Geography and Ethnography: This is the study of places and their peoples. It also can include maps, gazetteers and itineraries providing descriptions of key ports written for travelers and ship captains. Works of this category may fall within history, philosophy, mathematics or similar subjects as well. 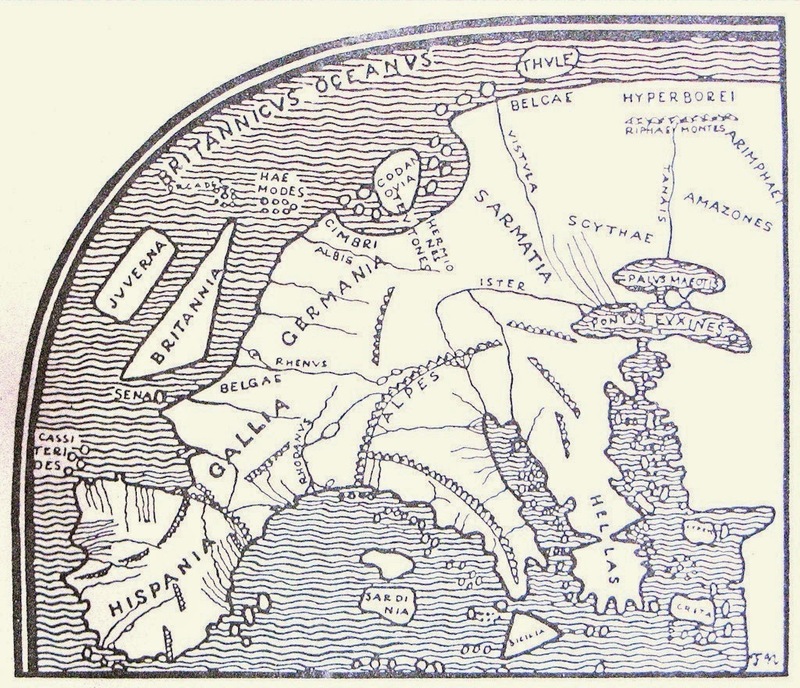 Examples include Germania, De Situ Orbis and The Chronicles of Huayang. History: This includes attempts to create chronologies of past events or biographies but also includes books that discuss laws of history, ethnographies or larger ideas. It is not uncommon for such works to veer into philosophy or religion, or to be efforts to illuminate those subjects. Methods vary considerably from place to place and different historians will have their own standards regarding source quality (one might consider legends and myths perfectly acceptable sources while another might insist on proof in the form of documents and texts). Examples include The Histories of Herodotus, The Muqaddimah, The Twelve Caesars, The Annales Cambriae, The Ecclesiastical History of the English People and The Records of the Grand Historian (Shiji). Law: This includes law codes, contracts, decrees, etc. These could be secular, religious or both. There is cross-over here with many other subjects (Theology, History, etc) especially since many Law Codes are framed within legend or history. Examples include the Twelve Tables, The Edicts of Ashoka, The Code of Justinian, The Magna Carta, The Code of Hammurabi and the Law of Manu. Manual: These are books that instruct or serve as reference guides. They include handbooks and treatises on cooking, grammar, painting, sculpting, witch hunting, oratory, engineering, rhetoric etc. For our purposes they can also include anything resembling scientific thought. Manuals can at times deal with other subjects or belong to them (many books on social etiquette will also include religious rituals or moral principles). Examples include Malleus Maleficarum, The Book of Rites, De Re Militari and the Kama Sutra. Magic: This goes beyond mere religious rituals and may pertain to the systematic description of magic in the setting, possibly including spells if such are a possibility. Memoirs: These are personal accounts of events. They may be autobiographical or not. The Commentaries on the Gallic Civil Wars by Caesar is an example. Mathematics: Any works dealing with numbers and their relationship with the world and change would fall under this category. It includes things like geometry and algebra. Examples include Plimpton 322, Elements (Euclid), and Zhou Bi Suan Jinh. Medicine: This includes anything from basic handbooks on healing and herbs to works on anatomy. Examples include The Kahun Gynaecological Papyrus, The Diagnostic Handbook, and the Hippocratic Corpus. Philosophy: This includes any work that attempts to deal with basic problems like morality, the nature of the world or its origins, but isn't quite yet at the level of science. It is generally noted for its use of reason, logic, thought experiments and rational arguments. It can be divided into categories like logic, ethics, metaphysics; or into schools of thought like stoicism and legalism. These should always be customized by setting since they vary considerably. Philosophy often bleeds into other subjects or predates them. The name literally means the love of wisdom. It can also include works of theology. Examples include The Symposium, The Incoherence of the Philosophers, The Nichomachean Ethics, The City of God, The Analects, and Guide for the Perplexed. Poetry: This includes a range of literature that uses rhythmic verse or special language to resonate with the readers or listeners. The types of poetry could include virtually anything that has existed in history: drama, lyric poetry, sonnets, epic legends, etc. Tailor this to your setting. Examples include: The Odyssey, Ramayana, The Metamophoses (Ovid), Layla and Majnun, Gladiolus (Livius), and Hamlet. Theology: For the purposes of this table, Theology includes actual theology as well as scriptures and other religious texts. It also includes hymns and religious rituals. Examples include The Rigveda, The Diamond Sutra, The Gospels, and the Book of the Dead. Quality is a particular concern in pre-printing press settings. Gamandria does not have such technology so all books would be copied by hand or at the very most by woodblock printing. When texts are copied by hand mistakes occur. Because most books are copied from other books, and these are often themselves second, third or fourth generation copies, this can magnify over time. Therefore original works are usually highly regarded for their accuracy. Quality here does not refer to the physical integrity of the book but of the state of its contents. Original: This is the original document. Perfect Copy: This text is identical to the original. Good Copy: A perfectly serviceable copy of the text with very few errors. Fair Copy: This is basically a useable copy of a text but it might have some minor errors. Poor Copy: This contains quite a few innocuous errors, misspellings, minor misattributions, etc. Bad Copy: This contains numerous errors but that are occasionally misleading to the reader. Terrible Copy: This contains numerous and regular errors that can mislead the reader. Dates, Names, Places, and other important information may be incorrect in key passages. Grotesque Copy: This is a deliberate attempt to distort the meaning of the text. It could be part of an effort to rewrite history or to mock a great work. Not only is text frequently mistaken, it is done with the intent to alter the overall message. You want to select when the book was written. It could be an ancient text or something quite contemporary. You can use a chart like the following by dividing up the time periods in the setting. In a setting where time travel is possible, you may want to include future ages as well. In Gamandria it is possible to travel in time using magic, but including it on this table would require a second table because it is so rare. Therefore I chose to limit it to past and present ages. This is where you flesh out the details of the book itself: where it was written, who wrote and for what purpose. For example you might have a History Roll written by the Ronian scholar Cleon about the Giants of the Rashua River Valley titled "A History of the Amla Tribes". Construct a table similar to the one below using the regions in your setting (again this uses the regions in Gamandria). You can roll on it once to determine the place of origin, but it can be rolled on again to help focus the subject matter of the book. Generally it could cover anything relevant to the region rolled. So a philosophy book from the Varian Sea could be from anyone person in that area covering any philosophical topic in the region. But you could roll twice, first getting the place of origin, but then having the topic cover another region (so a Philosopher from the Varian Sea writing about the philosophies of Khata). The table should also be tailored to suit the location of the library in question. 1) The Altars of Cael, an overview of the rites of Caelum by Bishop Apion: Written on parchment roll in 1354 by Apion Patrus (Bishop of Halenos) this text describes the religious practices of the Orcs of Caelum Republic with an emphasis on the cult of Lorgo. It is written in Ronian. While Apion expresses admiration for the engineering achievements of Caelum, he is disdainful of their religion, referring to Lorgo as "that tusked creature of the North". This particular copy is filled with mistakes, the most significant of which is Lorgo is spelled "Korgo" throughout the manuscript. 2) The Tactics of Gar-El by Yoshenas Maorides: The Tactics are written on papyrus roll in 490 by a former general who fought against the forces of Ogre Gate when they moved north into Rona. While it provides scanty details on the history it does offer detailed accounts of Gar-El's dwarven spearmen as well as the tactics and hierarchy of the army. The copy is generally good with some minor errors. Anyone who reads the entire text will find a reference to the dwarven legend of Khuber, who defeated the dragon Tohireo by adorning himself in diamonds (Tohireo's weakness) and allowing the beast to eat him. 3) The Laws of Poro by Pollio Gaius: This is a latter version of the book translated from Latar into Khubsi by a scribe in a parchment codex, the original rolls have been lost but were penned in 760 by Pollio Gaius (who would later conquer the province of Pasaara). This is both a commentary and a listing of the laws enacted by Sertorius Poro in 375. 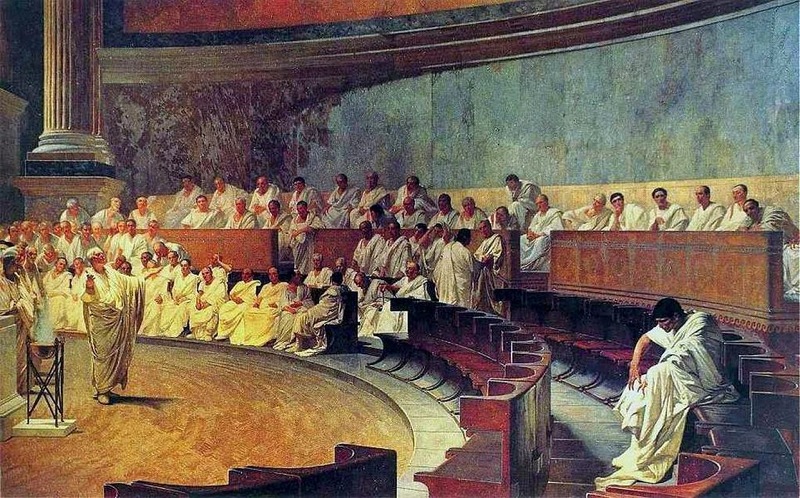 The laws themselves are bizarre at times, with one notable example stating that all citizens born with red markings become property of the Senate (for what purpose is unclear, though Pollio Gaius freely speculates). This is an excellent translation of the original text and a good copy of the original translation.